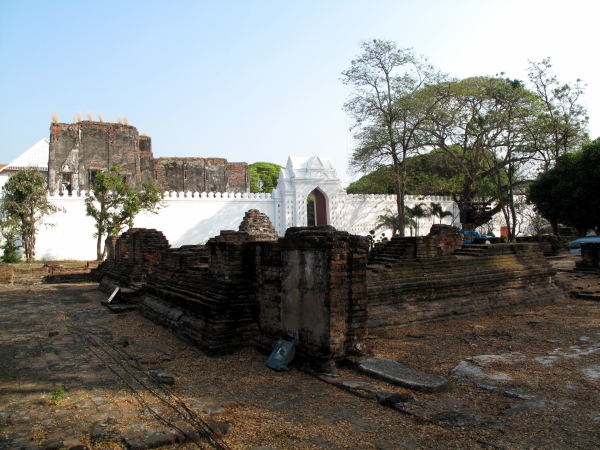 When King Narai, who ruled from 1656 to 1688, decided to establish Lopburi as his 'summer home' he set about restoring many of the city's ancient monuments, and had a large palace complex built near the center of town, on the Lopburi River. 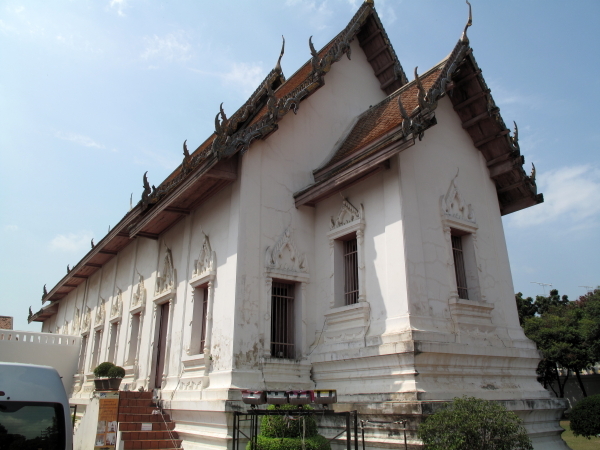 By this time, there were a number of Europeans in Siam, and the buildings of Narai's new palace reflect, more than any other buildings of the time, the influence of Italian and French architects who assisted in the construction of the palace. Many structures sport pointed Gothic arches, European proportions and details. As with all Thai palaces, the large complex can be divided into three zones: the 'outer court' that served many public administrative functions, the 'middle court' where the king would meet with his ministers and dignitaries, and the 'inner court' where no man other than the king was allowed entry. The main entrance to the palace complex is off Sorasak Road. The entrance is, of course, to the outer court. 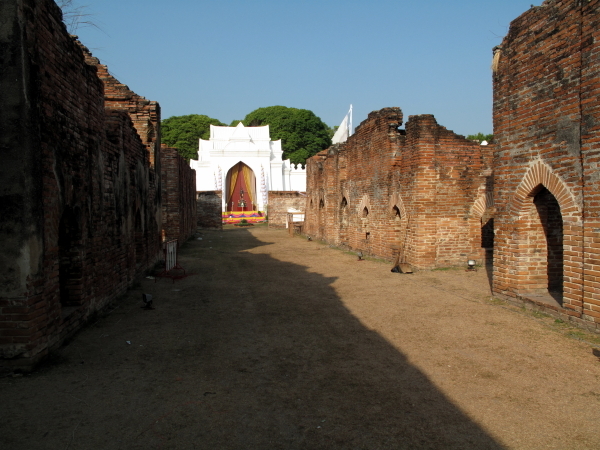 To your left is a long row of brick buildings that were once the warehouses of the palaces, storing the produce of the kingdom as well as gifts and tribute from Siam's neighbors and the European powers wishing to court favor with the kingdom. Curiously, the row of warehouses leads directly to the gate giving access to the grand Dusitsawan Thanya Mahaprasat Hall where foreign embassies were received by the king. It's easy to imagine that the whole design was meant to impress visitors with the wealth and power of the kingdom. Beyond the warehouses, but still in the outer court, are the ruins of two other large buildings used to receive foreign visitors. Passing between these two buildings, you first come to a courtyard where elephants were once kept, then another gateway brings you to Suttha Sawan Pavilion, which was once the main throne hall of King Narai. Curiously, the pavilion is on ground that is much lower that the rest of the palace grounds, which seems odd. Not much is left of the pavilion save for the platform and a few columns. A large gateway to your right as you face the Suttha Sawan Pavilion brings you first to the Dusitsawan Thanya Mahaprasat Hall, used for receiving foreign embassies, and then to the buildings of King Mongkut's nineteenth century palace, which now house the Somdet Phra Narai National Museum.